Even though I appreciate technology, it is important to remember there are low-tech tools that help our learning process immensely. 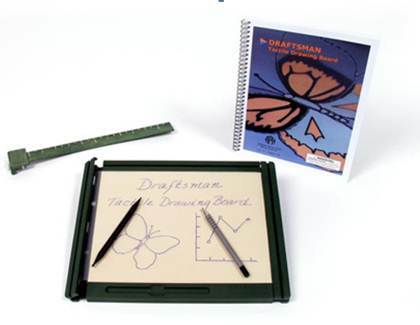 Click Draftsman Tactile Drawing Board by APH.org to see what students can use to practice their print letters and handwriting. These boards can also be used in math class. Students can draw what the math teacher is drawing and follow along with the class. The boards are also used to draw pictures and diagrams, hey even a game of tic-tac-toe!